Maureen Hall (vocals), Alan Smith (trumpet & flugelhorn), Mac Rae (clarinet & vocals), Iain McAulay (trombone & vocals), Mac Smith (piano), John Robinson (double bass) & Jim McKeown (drums) + second set Doris Fenn (banjo). 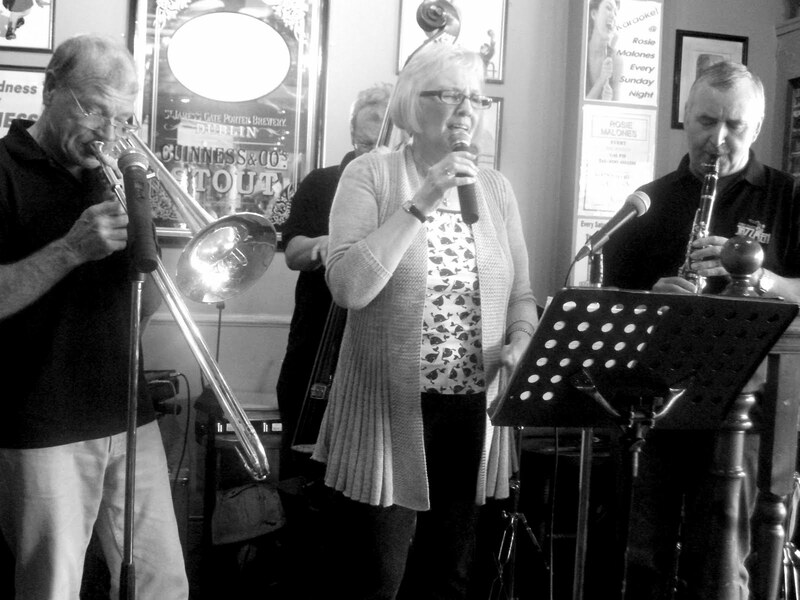 Maureen Hall's Rendezvous Jazz has settled in nicely at Preston Grange Community Centre in North Shields following the closure of the band's previous long-running venue. A sizeable room and reasonably priced beer made for a decent place to hear some jazz and many of the band's regular followers have made the effort to get along, determined to get their regular helping of good, honest, foot-tapping jazz. Veteran Mac Rae got things going with a vocal on Ice Cream before Maureen Hall got up to sing Should I (Reveal)? Trumpeter Alan Smith led the line well throughout the evening and on Wabash Blues he played flugel and muted trumpet to great effect. The jocular Scot Iain McAulay sang Dinah in his usual relaxed style and then the band played a steaming Redwing. Bandleader Hall took it down a peg ot two as she felt the Down Hearted Blues. The second set saw the band augmented by the excellent Doris Fenn on banjo and Hall sang, rather huskily, I Can't Give You Anything But Love. From husky to grizzled, Mac Rae provided the highlight of the evening singing St.James' Infirmary. He was cold-eyed, measured and one damn good story teller. Next weekend Rendezvous Jazz can be heard Friday and Saturday (5th & 6th August) in Windermere at the Manor Hotel. Should you fancy a weekend break telephone the hotel to check availability on 01539 445801. From September onwards Rendezvous Jazz can be heard at Preston Grange first Saturday in the month. Half past eight start, £2.50. at the door. Hello, folks! On Sunday August 7 we have international clarinetist and baritone saxophonist, Roger Myerscough, performing with The Vieux Carre Jazzmen at The Lit & Phil Library, Westgate Road, Newcastle upon Tyne. Roger's humour, passion and enthusiasm for his music is conveyed to audiences whenever and wherever he performs. The session commences at 3.00pm. Tickets are £10 (£8 concessions) from the Lit & Phil - Tel: 0191 232 0192. Bar and refreshments available. It'll be a cracking good afternoon of stomping New Orleans jazz – look forward to seeing you there. Running through till 11:00pm this is an opportunity to hear the cream of the region's finest jazz musicians. The full listing can be seen in the right hand column of the blog along with performance times. All proceeds go to the DEC East Africa crisis appeal. Ticket donations are a minimum of £5. Blues To Be There - Daryl Sherman/Jay Leonhart in Palm Beach. Those of us who have caught Daryl Sherman on her not frequent enough visits to the UK will know she is one dynamic lady. Singer, pianist, personality and lovely with it Daryl is absolute tops with me. Her shows at The Saville and Gosforth Trinity were among the highlights of 2010. Sadly, this year she didn't make it to the north-east and I didn't make it down to Pizza Express (it was the week of the Royal Wedding). However, if I lived in Palm Beach the problem would be solved as this article in the Florida Weekly explains. With Jay Leonhart on bass this promises to be an unmissable event. 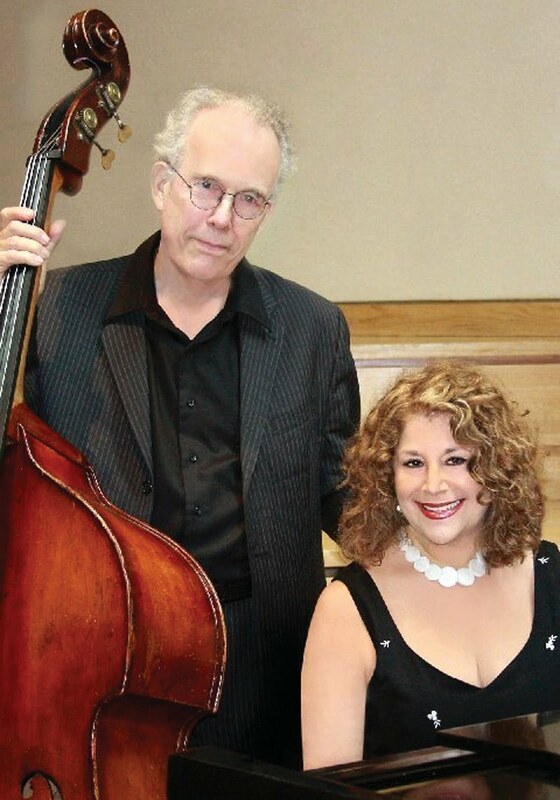 On the weekends of August 5/6 and 12/13 Daryl and bassist Jay Leonhart play The Colony’s Royal Room, 155 Hammon Ave., Palm Beach. Doors open at 6:30 p.m. and show starts around 8 p.m. Cost: $110 for dinner and show; $70 for show only. 659-8100. Herbie Hudson (tmb/hca/vcl); Gavin Lee (clt); George Richardson (keys); Alan Rudd (bs); Mike Humble (dms); Olive Rudd (vcl). Another fun-filled afternoon at Rosie Malone's with the band in fine form despite being once again trumpetless. Gavin Lee played simple system clarinet with a fluidity that few can match whilst George Richardson on his new Yamaha keyboard laid down some nice chords behind and dazzling solos up front. The vibes sound could have been created by Hampton himself. Herbie had his moments on harmonica, trombone and vox humana whilst the Humble Mike helped things along with his tastefull drumming on a minimilist kit. Mr Rudd was his usual solid self and Mrs Rudd gave out with an impeccable version of Just Friends. To round a perfect afternoon off I won a bottle of wine in the raffle. So I've decided to call it a day with the the jam session at Offshore 44. Between not being able to pay musicians and getting shouted at by drunkards who wanted to hear AC/DC it just became more work than it was worth. Fear not though. A new venue is in the pipelines and until that is sorted out I suggest having the jams in my new house, which has ample space for many musicians, as well as ample parking. Plus this way we don't have to deal with the pesky audience. The first rule of Jam Club is: Tell Everyone About Jam Club. You can guess the second rule. Also, bring your own booze, amps and friends, and you're perfectly welcome to come just to listen. The first session will be this Thursday, so come up to the Newcastle General Hospital and then call me (07963 398202) for directions. On Radio 2 tonight (Wednesday 27th) at ten o'clock there is the first of a two part programme celebrating the life and music of Louis Armstrong. Satchmo by Satchmo: the Louis Armstrong Tapes is broadcast in the week leading up to the 110th anniversary of the birth of the great man. Graeme Stephen (guitar & electronics), Paul Harrison (organ & electronics) & Chris Wallace (drums). In recent years the fertile Scottish jazz scene has regularly despatched a crop of fine young players down the A1 to play on Tyneside. Last night at Schmazz @ The Cluny the trio Breach played to an attentive crowd culminating in sustained applause long after winning an encore and returning to the stage. So, this was a good gig! Graham Stephen is a master guitarist, organist Paul Harrison is a multiple award winner, so too Canadian drummer Chris Wallace. The trio's music is difficult to categorise - modern jazz both ''contemporary'' and 1950s ''modern jazz'', Hammond groove elements, terrific swing sections and wonderful guitar playing. Graeme Stephen has it all - great sound, great stylist, evoking McLaughlin, Scofield, Lagrene, the ''Great Guitars' of Byrd, Ellis and Kessel (and fellow Scot Martin Taylor!). The remarkable thing about Stephen is he can play a million notes yet still be the epitome of restraint and taste, never wasting a note. Tunes from the debut CD On the Walk were aired including There It Is, Thirst, Horizons and Blink (Stephen exceptional on this one). The encore Makendonsko (based on an east European folk tune) was a number that didn't make it onto the CD - I hope it is on the next one! What is The Big Audition with Jamie Cullum? We're putting the call out to every high street in the country, looking for real music talent, to give someone the chance to launch their music career. The competition is open to everyone. Whether you're a singer or a musician, a solo artist or in a band, this could be your big break. Whatever you’re into, from rock to pop, folk to rap, we want you to share your talent with us. Our love of live music goes back 40 years to when our founder Peter Boizot opened the PizzaExpress Jazz Club in London. Jamie Cullum got his big break playing there and now he's back to help us find the next big name in live music. The sad news has reached me of the death of Frank Foster the former Basie tenorist and later leader of the band after the Count's death. Frank was an iconic figure who apart from his post bop tenor playing was a fine arranger and composer - Shiny Stockings perhaps being his most well known composition. When he stepped out front of the Basie Band to blow on, say, Jumping At The Woodside you knew sparks were going to fly. I was privileged to hear him several times in Newcastle with the Basie Band and in later years at Sunderland Empire fronting the Post Basie Band. 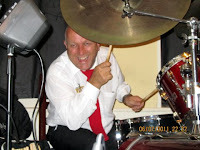 The YouTube clip below has him giving a virtuoso performance on After You've Gone with that latter band - it is a blast! Prominent in local jazz folk lore is the fabled night when several Basieites, after a City Hall concert, sat in at the old Down Beat Club in Carliol Square where they locked horns with Ian Carr, Mike Carr, Gary Cox of the Emcee Five. Legend has it that Frank took care of the business that night. I wonder, is there anyone around who remembers the session? It would be early sixties I guess. Frank Foster died today, July 26, 2011. His passing will be mourned in jazz circles the world over. He was 82. Jazz on the Tube. Zoe Gilby Quartet @ The Cherry Tree, Restaurant, Jesmond. Ham Hock Terrine, Crisp Hen's Egg, Dandelion Leaf and Warm Toast washed down with Antonio Carlos Jobim's Waters of March made for one glorious starter. The Chef at the Cherry Tree has the qualities that Leiber and Stoller extolled in Zoe's next number - Some Cats Know. This guy certainly knows how to put together a Butter Roast Corn Fed Chicken, Silver Chard and Roasting Juices main course and Zoe knows how to serve up a ballad like Time After Time. Our girl, forsaking her diva dresses for a modest mini, told the story (in song) of a London pub - The Midnight Bell. Based on one of Patrick Hamilton's stories from his trilogy Twenty Thousand Streets Under The Sky, it's a Zoe original that captures the despondent and depressive mood of the book perfectly. The Dry Cleaner From Des Moines - was there ever a more enigmatic song title? A Weaver of Dreams, I'm Always Drunk in San Fransisco, I Only Have Eyes For You were all done in Zoe's unique style whilst the Vanilla Panna Cotta, English Raspberries and Raspberry Shortbread were equally scrumptious. Messrs. Champion and Williams left their ACV hats at The Bridge and played some tasty solos. Mark's blast on Caravan kept wagon wheels turning whilst those who hadn't previously heard 21 (?) year old drummer Richard Brown were sent into orbit. Centrepiece, followed by That Old Black Magic brought things to a close. In the former, Zoe and Mark traded off each other whilst Andy did a bit of 'sawing' in the latter. An evening of good food and good music. Bill Ashton, founder and Life President of NYJO (National Youth Jazz Orchestra) has written a tribute to Amy Winehouse remembering the days when, as a 16 year old aspiring jazz singer. she spent a brief period of time with the band. It's here on the LondonJazz Blog. Lance. Andy Champion (double bass), Graeme Wilson (baritone & tenor saxophones), Mark Williams (guitar), Paul Edis (keyboards) & Adrian Tilbrook (drums). The current season of Splinter @ The Bridge gigs drew to a close with a commanding performance from Andy Champion's ACV. The quintet played Manchester Jazz Festival the previous day to great acclaim and a Dancing Dude! Here at The Bridge they were on home turf, sure to get a great reception with or without DDs!. The material was a mix of tunes,some old, some new. Jack in the Green, A Line Made by Walking and the eponymous number from the debut album Fail in Wood have developed into razor sharp workouts for all five musicians. The fiendishly difficult material was dispatched with aplomb. Outrageous solos were plentiful and when Mark Williams picked up a Flying V we had finally seen and just about heard it all. Pianist Paul ''Moog'' Edis cut a Nosferatu-like figure enveloping the audience in swirling mists of electronic sound. The band played it loud (Williams in fusion mode) then without missing a beat, inserted a few bars swingtime here and there before returning to the stated theme. Champion's New Peculier was every bit as good as Old Peculier (the legendary brew). A killer set concluded with a murderous Without Bones. Hearing it, with Adrian Tilbrook, en passant giving a drum masterclass, was worth the admission money alone. Russell. Photos. The ZOE GILBY QUARTET is tonight's Dish of the Day at the Cherry Tree Restaurant (9 Osborne Rd., Jesmond. 0191 2399924.) Food from 6:30pm and Zoe from 7:30pm. Tonight's quartet will comprise Zoe on vocals, Mark Williams, guitar, Andy Champion, bass, and Richard Brown, drums. An evening to delight the tastebuds. Chappell of Bond Street proudly presents a unique evening of jazz, with the third of its prestigious 200th anniversary fundraising concert series in aid of Centrepoint, the leading charity for homeless young people. On Thursday 15th September, the extraordinary Kit Downes Trio will perform an exclusive jazz concert to just 100 people. Tickets are £25 and the evening promises a mouth-watering feast of jazz by this hugely exciting and highly respected trio, led by the multi-award winning pianist Kit Downes, widely regarded as one of the UK's most exciting jazz musicians. This exclusive event will offer the audience the opportunity to meet the band, plus enjoy a range of special beers supplied by London's leading micro brewery, Meantime Brewery in Greenwich. This concert was opened in fine form by The Sage’s home-grown Blues Choir, led by Lindsay Hannon, doing a lively version of Basin Street Blues. They looked impressive in black with some purple and pink hair decorations and hats, standing in three rows across the stage. Songs included 'Tain't What You Do; Ain’t Misbehavin’; Another Man Done Gone; (think that was the title) and Down in the Treme. They did a grand job, together with pianist Alan Law, getting the audience into the Americana mood. Then came the Soul Rebels Brass Band who hail from Louisiana, two trumpets, sax, trombone, sousaphone and drums and percussion. This band had a generally Cajun sound which I think jazzers would find very appealing. There were few breaks in between numbers, each tune morphing into the next one, with a pleasing, constant fuzzy sort of thump (the sousaphone or a drum?) and the prevailing tinkle of a cymbal, which would be produced by a triangle in Cajun bands. They began with an extended version of Wimoweh, and continued with Night in Tunisia and St James Infirmary. The horns did short effective solos. They were determined to get audience participation by clapping and waving but I felt they overdid the encouragement somewhat, and I found it a bit off-putting. The band left the stage at what appeared to be the end of the set and some of the audience headed for the bar, and so missed the return of the band and the choir in a final song. But this was a really good set despite these hiccups. Irma Thomas, Soul Queen on New Orleans, who has won Grammy awards six times, looking really striking in a long yellow dress, took to the stage with her band of seven musicians, two guitars, two keyboards, trumpet, sax, and drums, including congas for good measure. Not sure if I can give her full credit as I’m no expert on Soul music and I must confess that, unlike the audience, I wasn't familiar with her work, but she certainly gave full enthusiastic value for money. Singing for about one and a half hours Ms Thomas let the audience choose most of the numbers and even sang Happy Birthday. She did mostly love songs, including, if I have the titles correct, Love Don’t Change, People Do; If You Want Love Bring it with You; Don’t Make Me Stop Now; Hold Me While I Cry and Breakaway, all sung in a strong earthy voice. I think she would have sung for the rest of the night if it had been possible. The three events that I’ve been to during this festival have made the definition of ‘Americana’ music somewhat clearer to me, but I’m left wondering how other people would define this term. Any clarification, anyone? Brian Carrick's small band played to a smattering of listeners under a hot sun beating down from a cloudless blue sky. Tin Roof Blues was a highlight with good clarinet from leader Carrick playing his treasured George Lewis instrument (circa 1902) followed by some of the best New Orleans' trumpet west of the Mississippi. This was a most enjoyable, relaxing, session. Next Sunday Carrick's band can be heard in Gosforth Central Park (two o'clock start). Matt Anderson – Tenor, Aubin Vanns – Guitar, John Marley – Bass, Sam Gardner – Drums. Some tasty playing by this young Leeds Based group. Leeds seems to be, if not the centre of the jazz universe, pretty close to it judging by the number of skilled musicians that have emerged from Leeds College of Music in recent years. This CD/Download is a fine example of where it's at - The Matt Anderson Quartet. It's contemporary, original, yet still based on those vital ingredients -harmony, melody and rhythm all knit sympathetically together. The quartet, who are beginning to receive well deserved and wider recognition, will open up the Sunday afternoon session at this year's Scarborough Jazz Festival with a specially commisioned work Songs of the Ridings. Shocked to learn the tragic news that Amy Winehouse has died. Although she moved in rock circles her voice was that of a jazz singer and she could channel that sound with a raw emotion that echoed her troubled life. 27 year old - what a tragic loss. Amy was found dead yesterday July 23. Jazz on a Summer evening at Kirkharle Courtyard. Friday July 22. A clear blue sky and late evening sunshine made a pleasant drive for three members of Ashington Jazz Club who travelled to Kirkharle for the first ever Friday night’s jazz session. 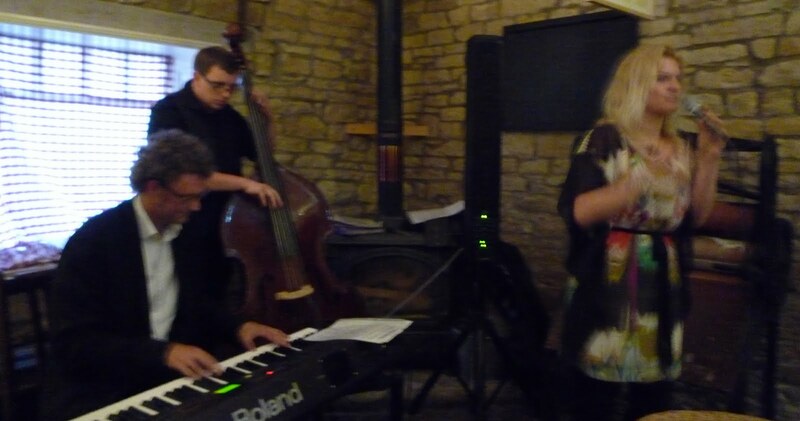 The trio performing consisted of Lindsay Hannon (vocals) John Pope (bass) and Alan Law (piano). An appreciative audience of about thirty attended in the room which we remembered as a museum which housed old bikes and train sets. Some features remained, such as a giant old mangle, farm implements and cartwheel. The Wylam Rocket beer went down well. The room was long and narrow (like the inside of a Rocket). With stone walls the acoustics were great. Also we must say that the sound quality was superb from the groups Rocket like combined amplifier and speaker. What a difference a day makes when Your dancing Cheek to Cheek and you Can’t Escape on a Trip on a Train began the selected programme. Lindsay’s beautiful voice became easy listening with Long ago and far away, Cry me a river and Lullaby of Birdland. The second set started with Alan and John playing Blues D & E. Next Comes love when you Dream a little dream while Making Whoopee! Joni Mitchell’s Blue Motel lead to a very interesting Blue Monk with superb, tongue twisting vocals from Lindsay. Then the One note Samba was not The wrong song done in A Sentimental Mood! The outdoor stage on Friday featured some well established performers such as Little Mo and also The Cornshed Sisters, but I decided for a change to turn my attention to an up-and-coming singer called Lesley Roley. And you may have seen her before! If I’m not mistaken Lesley works at The Sage as an usher in the auditoria, and sometimes in the cafe, which just goes to show that you never know who you’re talking to at The Sage. Lesley sang her own finely crafted songs, mostly about lost love, and accompanied herself with beautifully played lyrical guitar. ‘Safe as houses, hard as stone’ she sang with irony, about a lover who had gone away. The songs were sad and whimsical, and delivered with charm, especially when Lesley took two photos of the audience, reversing the usual situation where the audience does the snapping. Then out came the three friends to join Lesley with sweet tuneful backing harmonies, which reminded me of the singing of one of my favourite American rock bands ‘Fleet Foxes’. Maybe you know their music. Lesley had the difficult spot of being the first act on a chilly day, and she cheered us all up, despite the sadness of some of the songs. Not jazz but very enjoyable. Catch Lesley for yourself, at the Durant Hall in central Newcastle next Friday 29th July, at the launch of her 2nd EP. Raul Malo and the Northern Sinfonia - The Sage, Gateshead, Summertyne American Festival. I'd left my jazz hat in the back room of the Central Bar so no conflicting interests here. Instead I primed myself to enjoy a rather unique coupling - that of Raul Malo, former lead singer with The Mavericks, and the Northern Sinfonia. It occurred to me that my mother (Madame Annie Rankin LRAM, ALCM, LLCM) may be turning in her grave at the thought of her beloved Sinfonia in such a setting - she preferred Grand Opera to Grand Ol' Opry! However, I'm sure that once she'd heard the lush string sounds emanating from the orchestra she may have given a qualified nod of approval! The term Americana covers a very wide musical spectrum Cajun, Country, Appalachian, Gospel, Soul, Jazz, Blues and countless other sub-genre and tonight was most definitely Country. Opening up with Indian Love Call (fortunately without any Slim Whitmanesque yodelling) we were at once taken by the rich timbre of Malo's voice. A tango followed then The Everly's Let It Be, Eddy Arnold's Make The World Go Away and La Vie En Rose with the sweeping strings in Mantovani mode. Besame Mucho had the ladies sighing as Raul crooned "Kiss me again, Besame Mucho..."
More country followed until, eventually, we were on our feet applauding and Dancing The Night Away. Special mention here of the unnamed accordionist who helped add a touch of authenticity to the proceedings. So it wasn't jazz - it was still an enjoyable evening. Must broaden my horizons more often! Where: Pizza Express Jazz Club. 10 Dean Street. London, W1D 3RW. When: 27 July. Doors open 7:PM. Performance 8:30PM.Cost: £15. If you're in town next Wednesday then this must be The Place to be. It's been a long time since I last heard an American backed by a local rhythm section at the Corner House - perhaps Russell or one of our readers can come up with the answer as to who was the actual last American soloist at the venue? Whoever it was he would have been hard pushed to top tonight's performance by Greg Abate. This was no old-timer cruising on his faded laurels, this was a guy going for it - taking the bebop language and translating it into his own. The affable Italiano/Americano hit the deck running with all guns blazing on All The Things You Are. Anyone who'd turned up unsure of what they were about to receive were soon put in the picture. Angel Eyes,, Like Someone In Love, Confirmation, Billie's Bounce and a most wonderful Star Eyes played on flute - these were just a few of the selections where Greg's brilliance and his sense of humour shone through. His flute playing was also featured on I'll Remember April but for the audience it was a case of I'll Remember July 21. Paul Edis too was at his best and it seemed inconceivable that Greg, Paul, Mick and Adam could produce such a polished performance without having previously blown together. That's jazz for you it either happens or it doesn't. Herbie Hudson (tmb/hca/vcl); Jim McBriarty (clt/vcl); Colin Haikney (pno); Alan Rudd (bs); Mike Humble (dm.) Olive Rudd (vcl). Colin Haikney on keys this week. Colin can unsmile the late Marshall Walker with his inscrutable facade but playing-wise he does the biz with some dynamic solos. In particular, his romp on Avalon was worthy of all the reputed hidden wealth in that legendary isle although Herbie's hotcha harmonica solo could perhaps claim a percentage of the loot - not to mention Jim's vocal and his liquorice input into the mix. A couple of kids - maybe 2 or 3 year old - stole the show with their dancing next to the bandstand! Olive peaked on Sentimental Journey and Oxford Gold had the edge on Cherrypicker in the Ale Tasting Contest. Friday July 22-Sunday July 24. The Sage Gateshead. The Americana Festival has grown to be quite an amazing event featuring some fantastic artists from across the pond as well as lots of home grown talent. The Saturday night concert will be something really special with Irma Thomas - described as The Soul Queen of New Orleans - plus the Soul Rebels Brass Band and the Summertyne New Orleans Jazz and Blues Choir directed by none other than our own Lindsay Hannon. Nick Pride and Mo Scott will be in Performance Square on Friday afternoon and the Jumpin' Hot Stage will have Cajun, Country Rock and a a whole host of related genre on Saturday and Sunday. I'm planning on having a Hootin' Annie time! Full details from Sage Website. The diminutive Ms. Kidd arrived on stage barefoot, kicking off (no pun intended) with Georgia on my Mind, followed by the gorgeous Someone to Watch Over me, gracing us with the verse which always gladdens my heart! This set the scene for well chosen, classy Gasbook material. Familiar it may have been, but always expressed with fresh spin from Carol's unique style. Her years of experience showing through in her fluid movements, and playful & chatty rapport with her (slow to respond) audience. My Moment came unexpectedly in the second set when, poised to do a number from Annie Get Your Gun, she made an aside to Nigel referring to Mack & Mabel, whereupon I gave a solitary whoop! Hearing me, she called across asking me if I would like her to sing something from the latter...would I? So she did I Won't Send Roses ...what a thrill for me as she told us later that she doesn't do requests! Her guitarist Nigel Clark however was something else, an equal star of the eve. His acoustic chords were quite wonderful, especially in his solo How Deep Is The Ocean. It was a perfect combination in an otherwise cavernous Theatre Royal, mercifully adapted "in the round" giving that intimate atmosphere essential to an evening such as this. When Simon Spillett Emailed me last September to let me know that American bebop altoist Greg Abate was going to be in the UK July 2011 and that he, Simon, was looking to set up dates for him I had no hesitation in forwarding the info to the Wise Men of Jazz North East and the deal was done. Abate, as the YouTube clip shows, is a very lucid player steeped in the post bop idiom and I am looking forward to this gig with the anticipation built up over almost 12 months. The altoist is backed by the Paul Edis Trio thus reviving memories of those halcyon Corner House days when JNE would regularly feature American musicians with a local trio - first it was with Malcolm Saul, then Billy Harper and now Paul Edis. Please show your support and who knows but that the tradition may be maintained? “2011 - a golden age for jazz?” - A Yorkshire view. Why? There is so much more jazz going on than there has ever been, so many venues, bands, talented musicians in the North regions; in Leeds for example (besides us at Seven Arts) you have the Wardrobe, Spinoff, Assembly Rooms, Sela Bar, + new ventures at the Grove, Heart etc. In Yorkshire you have fantastic clubs/festivals in Wakefield, Grimsby, Boston Spa, Scarborough, Bradford, Sheffield, Huddersfield, Hull, York, Hebden Bridge, Marsden to name only some. And what of all those new big bands that have burst on the scene? The younger generation of baton wavers - James Hamilton, Kim Macari, Tommy Evans, Colin Byrne, the “veterans” Tony Faulkner and Ronnie Bottomley with their new big bands plus the youth bands such as the Leeds Jazz Rock Orchestra directed by Brendan Duffy and the Garforth Jazz Rock Orchestra directed by Dave Evans. And that is before you look at the community big bands like the North Leeds Jazz Orchestra and the Mike Booth Big Band (blog suggestion: “Are the Big Bands back?”…..) Anyway we run Seven Jazz at Seven Arts in Chapel Allerton, Leeds and are in our fourth year now – it is a really friendly venue with good acoustics, food, drink and ambiance. This autumn we are pretty busy - 25 concerts (on Thursday evenings and Sunday afternoons) 15 workshops (on Fridays and Saturdays) and 3 jam sessions. Seven Jazz is run by voluntary promoters, our strapline is “quality accessible jazz”. I read with pleasure the articles and memories about Nigel Stanger and Newcastle Big Band. I once sang with the NBB at the University Theatre Bar (where else?) on a Sunday lunchtime. In the interval I asked Andy Hudson if the band would play MacArthur Park in the second half. He said "if you sing it we'll play it", so I did. Afterwards Nigel asked me if I'd be available the following Sunday, "Sure", I said, anticipating being offered a regular vocals position in the band. The Stanger riposte left me in no doubt: "well don't expect a call from us.............."!! PS: The website is still as good as ever. Did you ever find out whatever happened to Jeff Hedley? Zita Frith (vcl); Lloyd Wright (gtr); Phil Richardson (pno); Ian Paterson (bs); David Francis (dms). The Way You Look Tonight was the perfect opener for Ms Frith who looked sensational in a mini-dress with a hemline only slightly lower than the ceiling! She sounded good too despite some teething problems with the balance. A good selection of standards, many of which were heard on the band's previous visit, provided the perfect complement to my Hot Smoked Salmon, Radish, Apple Puree, Wood Sorrel starter. I was in fish mode tonight and I opted for Whole Grilled Plaice, Brown Shrimp, Cockles, Samphire, Sea Spinach which was delicious but, pleb that I am, I'm not into D.I.Y filleting and it was finicky - back to steak for my next visit. The set closed with a spirited version of The Boogie Woogie Bugle Boy From Company B complete with a Reveille blast by guitarist Wright. Lloyd was hot all night and pianist Richardson too had his moments in the sun. Last week I wallowed in the succulence of the British Strawberry Eton Mess in Rosewater and I saw no reason to change. It was as sensuous as Zita's Choo Choo 'Ch'Boogie done as slowly and evocatively as Louis Jordan's original wasn't. Both versions work. More sensuality on Loverman as well as great solos from piano and guitar. Bass and drums held it all together and the final Lullaby of Birdland finished off an enjoyable evening. Not 100% jazz but close enough. Sam Wooster (trumpet), Paul Dunmall (tenor saxophone), Mark Sanders (drums), Chris Mapp (double bass). A day of cats and dogs weather-wise no doubt deterred some yet there was a healthy turn out for Jazz North East's latest On the Outside free jazz gig. New kid on the block trumpeter Sam Wooster was in the exalted company of reeds maestro Paul Dunmall and first-call free jazz percussionist Mark Sanders together with the emerging talent of bassist Chris Mapp. Dunmall has been a frequent visitor to Tyneside over the years but somewhat surprisingly this was the first time he had set foot in the Bridge. On entering the upstairs room he said ''Nice room''. This has been a common reaction by several visiting musicians new to the venue. It certainly does have an ambiance particularly suited to intimate, small group performances. The beer selection is always excellent and on this occasion the Oxfordshire brewery was represented at the bar - it went down well. The quartet chose to play acoustically and in retrospect perhaps Wooster should have been on a mic as Dunmall produced a full, big sound and when in overdrive with drummer Sanders it was sometimes difficult to hear the trumpet. Wooster isn't, on this showing, a powerhouse show off type. He was very much into the group dynamic, listening to the others, particularly Dunmall and the intricate trumpet/tenor interplay produced variously divergent then parallel lines. Sanders was on the case throughout - he knows the vocabulary inside out - and bassist Chris Mapp proved to be more than capable (his sound and approach suggested he is likely to be a rather good straight ahead player). A good session with quite a few CD sales on the night. The gig was a joint promotion by Jazz North East with Jazz Action's Splinter @ The Bridge. 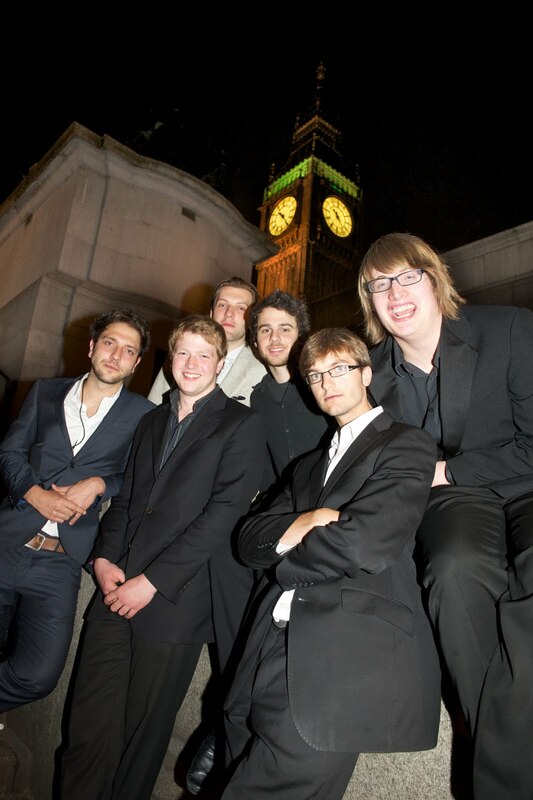 Next week's Jazz Action session, the last of the season, features the mighty ACV (7.30 pm, £5.00. on the door). Russell. FRITH ST NE1 BAND featuring vocalist Zita Frith. is tonight's offering at the Cherry Tree Restaurant, 9 Osborne Rd., Jesmond. 0191 2399924. The band, which consists of Zita on vocals along with Lloyd Wright (gtr); Phil Richardson (pno); Ian Paterson (bs); David Francis (dms) play quality cabaret style jazz which blends in perfectly with the restaurant's intimate atmosphere and superb cuisine. Food from 6:30pm, music from 7:30pm. The hugely successful, high-powered and influential partnership between Yamaha in association with Jazzwise, PPL and the All Party Parliamentary Jazz Appreciation Group celebrated the fifth year of its jazz scholarship programme at the All Party Parliamentary Jazz Appreciation Group's annual ‘Summer Jazz’ event in association with Jazzwise and PPL in the Atlee Suite, Portcullis House, House of Commons on Wednesday 13th July. Following an inspired performance by the Joe Stilgoe Trio, six winners representing the cream of young British jazz talent put in an exceptional performance, after being nominated for special consideration by the heads of jazz at six of the UK’s leading conservatoires. Award winning Jazz FM presenter Helen Mayhew and Yamaha Music Education Manager Bill Martin presented scholarships to Nick Costley-White, a guitarist studying at the Guildhall School of Music & Drama; pianist Chris Eldred, a student at Trinity College of Music; Chris Hyson who studies double bass at the Royal Welsh College of Music & Drama; drummer Jonathan Silk, a student at Birmingham Conservatoire and tenor saxophone students Riley Stone-Lonergan from Leeds College of Music and Josh Arcoleo from the Royal Academy of Music. All six scholarship winners who are about to leave college each received £1000 to help set themselves up as they embark on their new musical careers. More importantly the unique platform of a performance at the Palace of Westminster provided the opportunity to showcase their talent not only to Members of Parliament from both Houses who are interested in jazz, but also prominent invitees from the jazz community, including press, venue operators and record company executives. It's raining - to be polite about it - and the Chilli Road Band have an open-air gig providing the "inspiration" for the runners to complete the Great North 10K Run. Admittedly we are in a what is described as a marque although small tent would be a better description. I should explain that the CRB, today, consisted of steel drums, pans, congas, kit, 5 trumpets, trombone, 3 saxes and flute. It was all very intimate - and wet and muddy! Nevertheless, Canteloupe Island, The Chicken, Blue Bossa, Ska Blues and other numbers certainly got the runners increasing their pace! It was a non stop blow and I felt knackered after "swimming" home. I decided today there would be no Jazz Café, Central Bar or Bridge Hotel. Apologies all round. Instead I read Let Me Die by Megan Abbott and watched Mark Cavendish win yet another stage of Le Tour. If you haven't read Megan Abbott and like Raymond Chandler this babe is Chandler's literary heir. I'm now chilling out with Peggy Lee's Dream Street. I've got Dream Street on CD but I'm playing the vinyl - scratches and all - sounds better that way! It is with great sadness that I have to report the death of Eric Delaney. One of the finest drummers this country has ever produced I followed his career from the days of Geraldo until recent years when I was privileged to meet him on several occasions up here in the north-east. Broadcasts with Kenny Baker's Dozen, Melody Maker All-stars LPs, hearing his own big band both on record and at Newcastle City Hall as well as enumerable small bands - all left a lasting impression with me. I well recall taking him over to The Porthole in North Shields last year wher e he sat in with the band and, using only a snare drum, he dazzled everyone with his breaks on Cute. He was a close friend of the late American drummer Louis Bellson and they made a much sort after drum duo LP together (Repercussion). Eric was very proud of that session and the last time I met him he had a copy of the sleeve with him. Another LP (Conversations) saw Eric holding his own alongside Bellson, Buddy Rich and Kenny Clare. Fast company indeed but Eric moved easily in fast company! In a business that's well endowed with characters Eric was a character's character. Speaking to a close friend of Eric's she told me how upset he was at the death of Jack Parnell - well he's up there with Jack now and won't they have some stories and memories to exchange? Rest in Peace Eric - you were the absolute best and I was proud to have known you. Eric died on July 15, 2011 aged 87. No, not another deceased jazz musician, but a Swiss writer, whose work is being hailed by a small group of people, known as the Robert Walser Institute (see http://www.instituterobertwalser.com/). I mention this because jazz singer Gabi Heller is involved, and some of us jazzers were at a very entertaining reading of Walser’s work on Friday evening. This was held at Culture lab onsite, which is one of the Arches on Forth Street, Newcastle. The readers, Gabi, Claire Webster Saaremets and Tim Bennett were all accomplished actors who read well, such passages as Walser’s ‘Job Application’ in which he said that he would be a faithful honest employee who just wanted peace to get on with the job. This was a refreshing contrast to the way people are encouraged to do such applications now, by praising themselves profusely. The writing is hard to describe, showing an original way of looking at the world, questioning everything, sometimes winsome, with contradictions, and with some parts where the reader is unsure whether the material is autobiographical or not. After a piece about a flower ceremony, the readers picked up flowers, then listeners were encouraged to take the flowers provided. Each flower had a label attached which bore a quote from the writer, for example ‘Who has an airy spirit, is more likely to go bonkers from time to time’ In fact, Walser spent the final years of his life in an asylum, but as Gabi suggested, no-one seemed sure of what this illness was, and it may have been simply that he couldn’t quite cope with mainstream life. It did produce the following quote from Walser who, when asked why he wasn’t writing, replied that he wasn’t here to write, he was here to be mad! The readings were interspersed with music which had been inspired by the work, such as a piece by guitarist Glenn Jones entitled Snowdrops (for Robert Walser). And this is where the jazzers could get involved, as the work is crying out to have some kind of musical commentary. I suggest a lone saxophone or clarinet with drum accompaniment, just for starters. Discussion of the work was encouraged, and there was a book display, and also wine and nibbles, so what’s not to like? More Walser inspired events are promised for the future I’m glad to report. Ann Alex. Just wondering if anyone's aware of a project in the U S involving the music of Gil Evans? A guy called Ryan Truesdell has been given access to all of Gil's manuscripts & charts by Anita & Miles(Gil's wife & son). There is a huge amount of previously unheard & unrecorded music of Gil's which has been gathering dust since his death. The idea is that the best of all the material is to be recorded (starting in 6 weeks time) and a CD will be released on May 13th 2012 which would be Gil's 100th birthday ! Apparently there's material from different phases of Gil's career - ie The Thornhill Years, New Bottles Old Wine era, The Monday Night at Sweet Basil Orch etc. Anyone interested in following this up can find everything here. Olive Rudd (vcl); Herbie Hudson (tmb/vcl/hca); Jim McBriarty (clt.alt); George Richardson (pno); Alan Rudd (bs); Mike Humble (dms). I always experience a feeling of disappointment when Ray Harley isn't in the front line. However, such is the quality of this band that, after a few numbers and a beer or two, my ears become attuned and the resultant sound is as good as any Dixieland band around. Today the Maine Street Mob were on a roll after their recent "cruise" aboard the Earl of Zetland - the floating restaurant moored off Royal Quays, North Shields. Jim McBriarty, recently certified as A1 after his recent health problems blew his socks off on both alto and clarinet. Particularly impressive was his clarinet work alongside Olive on Maxine's How'dja Like To Love Me? - well as for me I'd like it fine (to quote the lyric!). Jim also sang If I Could Be With You in that winsome deadpan style of his as well as exchanging clarinet and alto choruses with Herbie on harmonica and trombone. George and Alan were on form as was Mike with his drumming on Coney Island Washboard. When a friend gave me this disc last year I'd forgotten all about the Polish alto player - how lovely it was to hear this quite amazing quartet again. 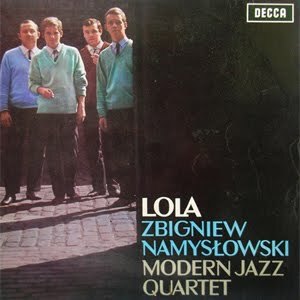 Back in 1964 we had no idea that such lyrical, original jazz was being played in Eastern Bloc countries until the quartet arrived in Britain and this LP was cut in London. It's hard bop with a folky traditional Polish feel to it - apart from an up-tempo Old Man River that positively steams - that I find compulsive listening. As a player he is up there with Cannonball who himself spoke glowingly of the altoist's prowess. Lola isn't on Spotify but quite a number of Namyslowski tracks are. Check him out. I gather he is still active in Poland. So says Madeleine Peyroux, during her interview on Radio 4’s Woman’s Hour today. There was a brief sample of her winsome version of Dance me to the End of Love as a taster, then Ms Peyroux told us about her latest album, entitled Standing on a Rooftop, which was recorded with Bill Wyman, whom she met at a BB King gig. She described the album as ‘American Roots’, though it has a cover of a Beatles song, but also some Dylan and Robert Johnson. Peyroux has been described as a jazz/blues singer, though she said she thinks of herself as ‘Americana’. The interview revealed that she isn’t too keen on classifying her music too precisely, then she proceeded to do an intriguing cabaret-type song Don’t Pick a Fight with a Poet, accompaning herself on guitar. She grew up in the USA and Paris, influenced by Edith Piaf and Jacques Brel, and particularly likes dramatic songs. A truly musically broad-minded sweet voiced lady. CD Review: The Swing City Trio - What a Little Moonlight Can Do! Steve Andrews (ten/clt); Roy Cansdale (bs); Roly Veitch (gtr/vcl). A delightful little gem by three outstanding yet understated (and often underrated!) musicians. On tenor Andrews takes a central path flanked by Coleman Hawkins and Ben Webster to produce some of the best mid-period tenor solos around - and I don't mean around here - I mean around anywhere. Likewise his sound on an old plastic Boosey and Hawkes Regent clarinet indicates that that instrument was worthy of much more than the student market it was aimed at! Steve even uses a tin whistle on Tishimingo Blues to great effect. Roly, as well as his sensitive guitar chording, gently croons several of the songs he often features on gigs. In particular, I Wished on the Moon, I Saw Stars and The Touch of Your Lips stand out although, in truth, there aren't any 'throwaway tracks'. Ably supported by Roy Cansdale's bass, this is one of those CDs that exude class and if you play it in the car make sure the seat recliners work you know What a Little Moonlight Can Do - you could hit lucky! 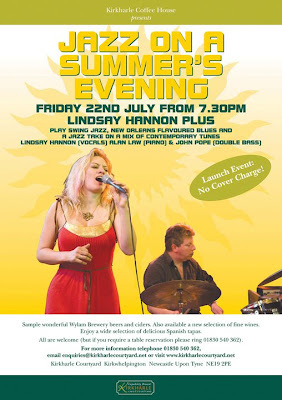 Kirkharle Coffee House, just off the A696 Jedburgh Road some 20 miles outside of Newcastle are launching Jazz on a Summer's Evening on Friday July 22 with two 45 minute sets from Lindsay Hannon (vcl); Alan Law (pno); and John Pope (bs). Entry is free and real ales from Wylam Brewery will be on sale. Pity you have to drive to get there as I don't imagine there's a bus every ten minutes. Gerry Richardson Quartet @ The Cherry Tree Restaurant. Gerry Richardson (pno); Garry Linsley (alt); Neil Harland (bs); Paul Smith (dms). The Cherry Tree was crowded tonight - it was Graduation Night. Graduation Night it may have been for some but the members of the Gerry Richardson Quartet graduated with Hons. many years ago and tonight proved they had lost none of their skills - and nor had the chef. The Peppered Squid with Bury Black Pudding, Broad Beans, Rocket and Parsley Pesta was as piquant as Steve Kuhn's Chicken Feathers played with an infectious Latin beat. A Train and Just Squeeze Me were a couple of more familiar numbers that provided the virtual sauce to my Wallington Estates Rump Steak, Marmite and Peppermint Butter, with French Fries and Watercress - appropriately, both pieces were by Ellington for indeed this was truly Ducal fare! Oh! and yes - Marmite never tasted like this before! The room was heating up and Gerry managed the impossible trick of removing his jacket without missing a beat - well not many! I was tempted to try and do the same whilst eating my British Strawberry, Eton Mess, and Rosewater - ordered upon the waitresses recommendation - but decided it wasn't worth the risk of spilling this most enjoyable dessert. The final number was very applicable - How Sweet It Is! The quartet swung and grooved. This was Gerry in Jools mood. He threw in a couple of vocals but the P.A. didn't do him any favours. Garry blew, with apparent lack of effort, some scintillating choruses. If Canteloupe had been on the menu his take on the island of that name would have had everyone eating Canteloupe! Paul and Neil - as dependable a duo as you'll find. Shame there wasn't room for a small dance floor as tonight's combo would have had them crowding the floor. Also enjoyed the company of Brian and Sheena Chester. Finally, a special thank you to the Head (?) Waitress for giving me a pen without which these notes could not have been written! John Cowan (cor); Jim McBriarty (clt/alt/vcl); Herbie Hudson (tmb/vcl/hca); Colin Haikney (pno); Alan Rudd (bs); Ian Hetherington (dms); Olive Rudd (vcl). Maine Street Jazz returned to The Elephant for our monthly meeting and we were pleased to welcome Herbie back after his extended holiday in Turkey and Jim now back to good health. Unfortunately, Ray Harley was unwell and he was replaced by guest trumpeter from Dumfries, John Cowan on his first visit to Ashington, and what an impact he made! Sitting throughout the evening he was transplanted into the band without any obvious rejection symptoms and the musical unit was complete. The opening Streets of the City got the evening off to a flying start and everything that followed was delivered with style. This group can call upon three vocalists in Herbie, Jim and the effervescent Olive who chooses her selected songs with care. We'd like to hear more from Mrs. Rudd but her policy seems to be to give the fans a taste of her talent at regular intervals and the audience will be back for more. Or maybe she prefers to rest in between numbers. Whatever, we really enjoy her contributions to the evening. Herbie on harmonica is always a delight as his abililty with this instument is unique in Jazz Circles. Jim's clarinet and sax were swingingly sweet and blended so well with Herbie's full trombone and John's muted trumpet solos. The back room trio drove the front line onward with superb displays of their professional technique. Alan's bass solo on Buddy Bolden Blues was superb and Colin's keyboard presentation on Melancholy Baby a delight. Lets not forget our drummer who drove everyone forward witha smile and tonight we actually got to see his face behind that cymbal. What more can you say when each member of this great swinging group give us an exciting performance on each visit, playing their part inproviding a variety of tunes in many styles and arrangements? Herbie surprised all with his version of Isle of Capri as a calypso tho' I must say the accent was suspect' maybe Spanish or Mexican or whatever you wanted it to be. C C Rider came as a rockin' in rythmn style and had us jumping in our seats. Without naming all the programme it is fair to say that 19 different melodies over the evening was good value. May I remind you that our next meeting with MSJ will be on Wednesday, August 3rd at 8.30 p.m. at the Elephant. There is a treat in store for diners at the Cherry Tree Restaurant (9 Osborne Rd., Jesmond tel 0191 2399924) tonight. No I'm not referring to the superb menu which is a rare treat in itself but to the Gerry Richardson Quartet (Gerry Richardson piano and vocals, Garry Linsley tenor sax, Neil Harland Bass, Paul Smith drums). What makes this rather special is the opportunity to hear Gerry on piano rather than his beloved Hammond and to experience the all too rarely heard - in these parts - Garry Linsley on tenor along with two of the finest rhythm guys in Neil Harland and Paul Smith. Like the food - the music is a mouth-watering prospect. Paul Edis (pno): Chris Hibbard (tmb); Graham Hardy (tpt/flug); Graeme Wilson (ten); Mick Shoulder (bs); John Hirst (dms). My Heart Belongs To Daddy, one of only two non-originals - Black Orpheus being the other - got the set rolling in fine style. Tightly arranged with a distinct west coast feel to it -as "our man in Hong Kong" Colin Aitchison, here on a fleeting visit, astutely pointed out. The soloists are brilliant but the band's ultimate strength is in the arrangements and the compositions mainly by Edis. One piece, the title of which escapes me, had a disti nct Mingus feel, another an Ellingtonian concept whilst still maintaining Edis' own individuality throughout. 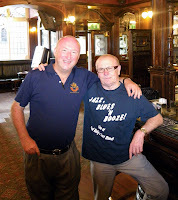 It was good to meet up with Colin (pictured on the left with myself) again and pleased that he can return to somewhere east of Suez with good memories of jazz today in the north-east (and the taste of some fine real ale). Colin, incidentally, can be heard on trumpet tomorrow (Monday) afternoon at the Crescent Club in Cullercoats and tomorrow night at the Corner House, Heaton with the Vieux Carré Jazzmen. Fiona Littlewood (vcl); Paul Grainger (bs); Dougie Fielder (ten); Stuart Findon (pno). Not a vintage Sunday at the Jazz Café musicwise although things may have picked up after I'd left. On the plus side Fiona sang some nice things such as Good Morning Heartache, Love Me Or Leave Me, Doxy, Now's The Time to mention but some. Stuart played what is sometimes described as arranger's piano and Dougie doodled. Pianist Colm Rooney played drums and Paul Grainger arrived to add the basslines which filled things out a bit. Not jazz I know, yet let's celebrate the 80th birthday of the wonderful American composer/lyricist Jerry Herman. He is quite breathtakingly talented, and from my fave show "Mack & Mabel" let's not say " I won't send roses" but rather...I would if I could! Just about every organisation distributes leaflets to promote their events - its an essential form of marketing. Now, according to The Guardian (June 30, p.8), 45 local authorities including Newcastle require that you buy a licence to allow you to hand out your leaflets. Jazz Café's Keith Crombie who unsuccessfully took the Council to court argued that "...the regulations infringed his rights to freedom of speech..." Keith had to buy a licence. In Leicester a licence costs £103 plus a further £26 per distributer per day. Paradoxically local authorities themselves produce a massive number of leaflets and pamphlets which surely leads to more of the litter they are supposedly trying to suppress! Brass Jaw:Ryan Quigley (tpt), Paul Towndrow (alt), Konrad Wisniewski (ten) and Allan Beauvoisin (bar). Jambone: 5 saxes, 4 trumpets, 3 trombones, Colm Rooney (pno), Ivan Scutt (bs), Bradley Johnston (gtr), (drums). Brass Jaw opened up to an audience comprising, in the main, friends and relations of Jambone! Where was the jazz fraternity who, with a couple of notable exceptions, were missing? This was incredible! Brass Jaw are unique mixing, as they do, free collective improvisation, solos and arranged passages to amazing effect. At times when the four musicians were wailing away in a fugue-like.manner I couldn't but help thinking that J.S.Bach would have loved the contrapuntal lines they were putting down. This wasn't Bach Goes To Town a la Alec Templeman - this was Bach going down to the Bigg Market on a Saturday night bender! Quigley is an amazing trumpet player and it was no surprise when "Big Band" Tony told me that Ryan was doing a Maynard Ferguson tribute at Wigan Jazz Festival. Paul Towndrow plays wonderful modern alto, likewise Konrad on tenor but the cigar goes to Beauvoisin for pumping the baritone so effectively. Brass Jaw are appearing at the Durham Brass Festival on July 16/17 - so you've got another couple of chances to catch them. Unfortunately you won't have any further opportunities to hear this edition of Jambone - The Sage's brilliant youth jazz orchestra. A lot of the players are moving on to Uni at such exotic seats of learning as Leeds, Huddersfield and points south. They went out with a bang!. I'm not going to quote names as the only ones I know are Bradley Johnston (gtr). Ivan Scutt (bs) and Colm Rooney (pno); but even if I did (and I'm hoping someone will send me the line-up) it would be unfair to single anyone out. When they hit the ground running on It Don't Mean a Thing I relaxed and said that this band could gig anywhere - Ronnie Scott's would be a good place to start! The two bands had been working together and at the end of each set they merged. This was good and the youth band had no problem carrying the ball. It was a brill night but come on folks surely you weren't all at the Mouth of the Tyne Festival?. There's an exciting prospect in store at The Sage, Gateshead, tonight. The Sage's own youth band the multi-talented Jambone are in concert with award winning quartet Brass Jaw (Ryan Quigley (tpt), Paul Towndrow (alt), Konrad Wisniewski (ten) and Allan Beauvoisin (bar)). Brass Jaw's recent CD - Branded - has been widely acclaimed and this is an outfit not to be missed. Catch them tonight at The Sage - Hall Two 8:00pm. £9. Lance. Ron Pollard welcomed everyone to his 50th Golden Wedding anniversary which by my reckoning means Ron and Joyce have been married for 2,500 years - or maybe it just seems like it! 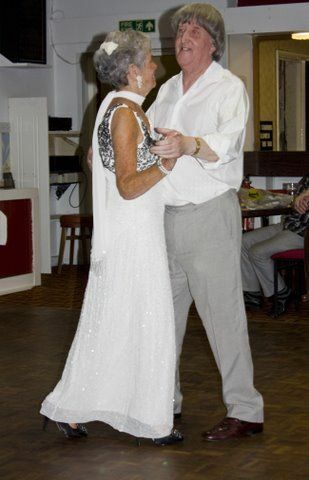 Only joking, Ron and Joyce, I think you are one of the happiest couples I know - your chemistry on the dance floor proves it. The Maine Street Jazzmen provided the music and were in good fettle. Jim McBriarty was back on clarinet and Ian Hetherington on drums. After the "Star couple" had twirled around the floor to The Anniversary Waltz the band set off in earnest with Big Butter and Egg Man. Herbie later sang Isle of Capri in a kind of Geordie patois and Olive sang Some of These Days diplomatically substituting "Your big fat mama" with "Your little sweet mama" as indeed befits the lady! A thought occurred to me as I listened to the band playing China Boy. When George Richardson replaced Malcolm on piano it was akin to the time that Joe Bushkin replaced George Zack in Muggsy's Ragtime band. Came the interval and the buffet was unveiled. It was sumptuous and provided by members appreciative of the amount of time that Ron and Joyce have devoted to the music they love. Several musos were in the audience including ex MSJ trumpet player Alan Smith, Roly Veitch, Mr and Mrs Bacon (Paul and Liz), Derek Cogger to mention but the ones I noticed. Nevertheless, it was a wonderful evening and long may you both - and the Jazz Club - prosper. Photos by Eddie Carson. Stan Legg, stalwart traditional jazz enthusiast and one of the people who helped set up Trinity Jazz two years ago, has passed away. A service will be held at Trinity Church, Gosforth High Street, on Friday 15th July at 2.30pm and all who knew Stan will be most welcome. Mike Durham. John Taylor kindly drew my attention to tomorrow's (Saturday July 9) Jazz Library on BBC Radio 3 at 4:00pm. It is a feature on the Alex Welsh Band who did so much to enliven the sometimes sterile trad scene up until the leader's death in 1982. Frank Brooker (ten/clt/vcl); James Birkett (gtr); Mick Shoulder (bs); John Hirst (dms). + Bradley Johnston (gtr). Sonnymoon for Two set the mood for this gentle romp down the centre of the jazz stream. with Brooker and Birkett proving the perfect foil for each other swinging along nicely through a latin tinged Out of Nowhere, There Will Never Be Another You, The Nearness of You and Swingin' The Berries the Emmett Berry tune that Berry recorded with Guy Lafitte back in the '50s. At one time it was the most requested tune on one of the BBC jazz programmes or so the late Alex Roberts once told me. Mention of Lafitte is apt as Brooker is stylistically akin to the late French tenor man with his biggish sound and effortless swing. Veteran campaigner that he is Brooker sailed through the changes as did Birkett who, tonight, was awesome. After Hank Mobley's This I Dig of You brought the first set to a close Birkett remained on stage for a couple of duo numbers with Bradley Johnston one of his 16 year old students. I'd heard the duo at this year's Sage Festival so knew it would be good and it was! Spain, in fact, was sensational! Watch out for this young man. Back to the main event and Broadway and Satin Doll as a Bossa kept things alive. Mick Shoulder soloed well and kept things anchored whilst John Hirst - inscrutable to the nth degree - played with taste and technique using mainly brushes. There was more but the number 11 bus takes no prisoners so I had to reluctantly depart. It had been a good night and even the walk from the Metro station in the precipitive downpour failed to dampen my spirits. John Cowan (cornet); Herbie Hudson (tmb/hca/vcl); Gavin Lee (clt); George Richardson (pno); Alan Rudd (bs); Mike Humble (dms); Olive Rudd (vcl). Today's line-up was enlivened by the inclusion of John Cowan frae Dumfries on cornet who blew a solid lead and had some powerful solos. Herbie wailed on harp, growled on trom and exercised his larynx too on such as Dinah - missing the opportunity to subsitute "Miss Dinah Lee" with "Mr Gavin Lee". He also posed the questione as to why he should be so Black and Blue? - take the shirt of Herbie - half the problem solved! 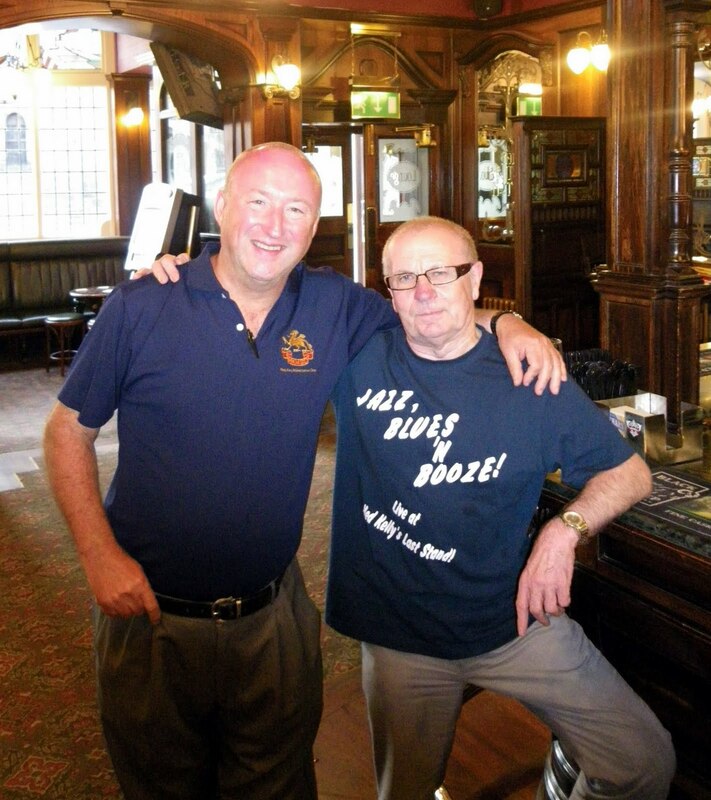 Mr Gavin Lee continues on the glory trail - Shotton, Gateshead and now South Shields! Hard Hearted Olive, Swung That Music and Shimmied Like Her Sister Kate before heading off down Bourbon Street. One of the best sessions and a good crowd. Customs House Big Band July 5 New Crown Hotel South Shields. The last open rehearsal before the summer break produced some new material as well as the old favourites. The band started with a smooth arrangement of Georgia On My Mind, Ruth Lambert ran through Cheek To Cheek and the band finished with a Thad Jones number Big Dipper. The concert section opened up with Five Foot Two Eyes of Blue (Has Anybody Seen My Girl? ), Ruth did the polished version of Cheek To Cheek, the band then played Arillo Del Mar? and Ruth tackled Mack The Knife, it was nice to hear Polly Peachum getting a name check instead of Satchmo's Lotte Lenya. Have You Met Miss Jones? well the band had and did her proud, At Last was Ruth in fine ballad form and the band finished with a funk number Here's The Rub, at times it felt like where's the coda? but they got there eventually. Most of the usual members were there with a few deps - Amber Reeve alto, Ian Wynd drums "Squib" ? trombone & Colm Rooney piano. A mention must be made of the 20 or so in the audience a record I think. 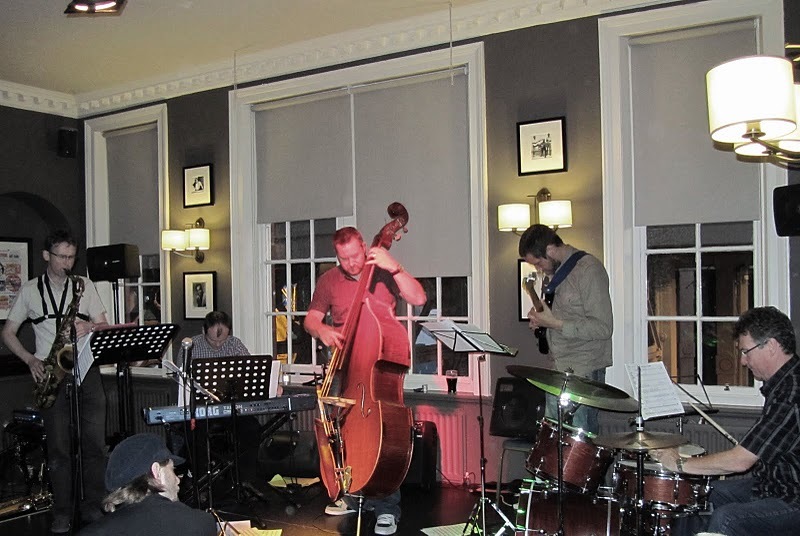 The live jazz interest is: Thursday 25 August Steve Fishwick Quartet Steve Fishwick (tpt/flg), Matt Fishwick (dms), Ross Stanley (pno) & Tom Cawley (Fender Rhodes). Sunday 11 September James Taylor Quartet (7:00 pm). £17.50. Saturday 8 October Brand New Heavies (7:00 pm). £30.00. Splinter @ The Seaside - The Trojan Rooms, Whitley Bay. July 3rd - Part 3: Ex Extreme. Ex Extreme: Stuart Collingwood (piano), Pete Tanton (flugelhorn), Mark Williams (guitar), Stuart Davies (electric bass) & Steve Wall (drums). David Carnegie's departure cast doubt on the future of Extreme Measures. How to replace him? Why continue? Well, the alumni assembled in the Trojan Rooms with new recruit Steve Wall to give it a go as Ex Extreme. Opening with Stuart Collingwood's familiar piece Nautical (how apt...nautical, seaside and all). Pete Tanton wrote Barbados by way of bon voyage (the nautical theme continued) to Davd Carnegie - nice one Pete. Stuart Davies, the one surviving original member from Carnegie's band brought Double Bubble to the party and it wasn't any toil or trouble to these guys. It was a jazz funk workout, energetic, fun and for guitarist Mark Williams (another one on double time) this was a case of cut loose, hang on, get out of the way, phew!!! Collingwood's Bananas was right up Steve Wall's street. This was loud jazz fusion territory and to the drummer's credit he was himself, not in any way trying to be a clone of David Carnegie. At times the volume levels made it difficult to hear Tanton's oh so lyrical lines. Tanton deserves to be heard! I get the impression that pianist Stuart Collingwood has a whole book of tunes he's written over the years. One of them - The Tank - from way back (1981) was a high point. It had a Blakey's Messengersfeel to it and if he's got more like this then lets hear them! A cracking set from an evolving, cracking band. Today being the first Tuesday in the month the Customs House Big Band along with Ruth Lambert hold their monthly open rehearsal. Starting at 7:30pm the band rehearse and hone new numbers to perfection. After a short interval to partake of the excellent ales served in the bar the band, along with vocalist Ruth Lambert, then give a free concert. Well worth looking in on. Ruth Lambert (vocals), Graeme Wilson (tenor saxophone), Paul Edis (piano), Andy Champion (double bass) & Tim Johnston (drums) On this beautiful summer's evening there was no moon at all and Ms.Ruth Lambert reiterated the fact by singing the Redd Evans/David Mann classic No Moon At All accompanied by the superb tenor saxophone of Graeme Wilson. It was good to hear I'm Glad There is You from Lambert's first CD So Many Stars with Paul Edis' sensitive piano playing to the fore. We know Lambert as a consummate interpreter of of the GAS book but, for a moment, she closed the book and turned to one of the great singer songwriters of this or any generation - Bonnie Raitt. The American's Love Me Like a Man was given the treatment - Lambert can certainly sing a blues. It would be good to hear one or two blues numbers in the set next time she's out and about. A particular highlight was Beautiful Love with wonderful phrasing of the lyric and the boys in the band (including a moonlighting Andy Champion) had some fun with Juan Tizol's Caravan. A cracking set from a class act.